Zondervan has long been a leader in Bible publication and the New International Version (NIV) is perennially one of the top translations purchased in the English-speaking world. The Leadership Bible is one of the many “niche” Bibles targeting a specific population. These Bibles use the text as foundation and develop life applications that are relevant to the target group. A partial listing would include Bibles for women, boys, girls, teen guys, teen girls, men, couples, outdoorsmen—infinite choices. This particular version focuses on leadership principles that are applicable in a variety of settings. Development of leadership information can follow a couple of different paths. The “home page” at the beginning of the book lists the various topics. The reader can find information on personal development, relationships, and skills—each with a relevant passage from Scripture. For more detailed study, each book of the Bible has an introductory section that states a leadership principle illustrated in the book. There is a brief leadership summary giving an overview of key people and relevant passages to illustrate the points made. Included is a short summary of each book and a table listing relevant points in the chronology of the book. Each chapter of each book contains a short Insight that makes a point about leadership. Profiles of significant persons are included throughout the entire volume. Another way to study is to carry out 52 topical studies, each of which deals with a specific leadership issue. The lesson for each week contains a “home page” that lists the topic for the week and its applications. The daily components for a specific weekly lesson will be found in various locations in the Bible, which can prove to be a little confusing, but the links back to the week’s “home page” are fairly clearly spelled out. There is no heavy, theoretical material in the leadership concepts. All of the ideas are basic but contain useful information that can be of help in a variety of situations. Nothing cutting edge just sound and practical principles. 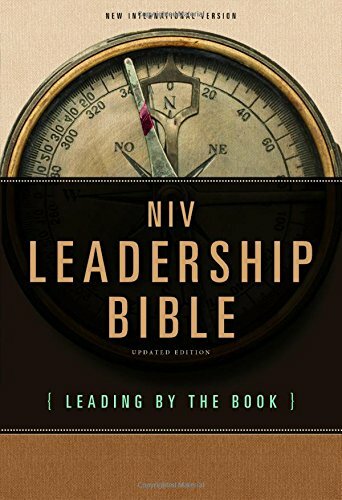 The NIV Leadership Bible can be a very useful resource for the person who wants to be engaged in leadership principles from a Biblical perspective.